We’d love your help. 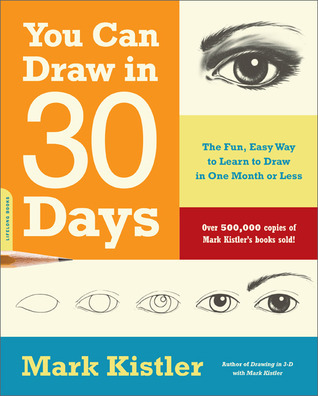 Let us know what’s wrong with this preview of You Can Draw in 30 Days by Mark Kistler. To ask other readers questions about You Can Draw in 30 Days, please sign up. This was my first "how to draw" book. Before using this book I could draw stick figures and ugly junk. After these 30 lessons I've drawn things that amaze me! This book boosted me well up in drawing options. Not via secrets or weird rituals though. Instead by simply explaining the fundamentals then providing accessible exercises to get the explanation into your memory. I flipped through several books in the "how-to draw" section and thought this one was the most clear and accessible. Plus, Mark' This was my first "how to draw" book. Before using this book I could draw stick figures and ugly junk. After these 30 lessons I've drawn things that amaze me! This book boosted me well up in drawing options. Not via secrets or weird rituals though. Instead by simply explaining the fundamentals then providing accessible exercises to get the explanation into your memory. I flipped through several books in the "how-to draw" section and thought this one was the most clear and accessible. Plus, Mark's enthusiasm throughout the book is pretty contagious. It's not the one and only perfect manual. There's a couple lessons that were a bit boring, and one or two that were tough. But I bet those lessons might vary from person to person, so that's kind of neat. Long story, short: I had a lot of fun, learned a ton, and drew some sweet pictures. Now I feel like I have a nice foundation for carrying on to more and more drawing lessons. Do yourself a favour if you decide to try these lessons out. Pick up a nice, new sketchbook and a decent pencil and eraser. For the $10 more all this will run ya it's worth it to work with nice things as you're learning. Terrible book. even the sample drawings are not good. The idea of the book is to give you shorthand for drawing, not teach you how to draw from what you see. Which is fine, if that is what you want, but some of the shorthand is wrong, placing a shadow between two objects (he does this with spheres and continues it) for example. In most instances there is a LIGHTER area between two spheres. So his drawing look really off. Then he shows planets and gets the shadows all wrong for where the light so Terrible book. even the sample drawings are not good. The idea of the book is to give you shorthand for drawing, not teach you how to draw from what you see. Which is fine, if that is what you want, but some of the shorthand is wrong, placing a shadow between two objects (he does this with spheres and continues it) for example. In most instances there is a LIGHTER area between two spheres. So his drawing look really off. Then he shows planets and gets the shadows all wrong for where the light source is shown. Frustrating. He teaches students to smudge far too early, which just makes their drawings look cheap, but makes the artist feel that they're getting somewhere. Smudging can work, but it takes so much more to do it well. He starts you out by asking you to draw a house, an airplane and a donut, without a source. And, I just don't believe these are things ANYONE can truly draw well without a source, especially the airplane. Have you actually thought about what an airplane looks like in perspective? And what is involved with an airplane, other than wings and a tail? To compare drawings after his classes (which are NOT of the same thing) and say people have improved is preposterous. But the biggest issue I have with this book is that he keeps saying other art instructors don't teach you how to draw. They simply set you up in front of a still life and expect you to understand the basics, to make the 5,000 necessary mistakes. I have been in MANY still life classes and this is not the case. Every class I've been to for beginners has had instruction in basic geometric representation. That's sort of the point. Otherwise you're just at a session, not a class. And even if you follow the book, you're still going to need to make the 5,000 mistakes. Because that's how you learn to improve. It's like he didn't understand the quote at all. ARG! But, honestly, if you're going to learn to draw, learn to draw from life. Or learn to draw from Jack Hamm, whose books are amazing. If you want to draw spheres get an orange, use a toilet paper roll for cylinders. Look at how light really falls, because this book is not going to help. If you want proof look at the drawings of the face for the students he had. There is no understanding there of what a face is. No understanding of an underlying skeletal structure, and at the same time, no style. I love cartooning style, where basic anatomy can be ignored, but this isn't it. Are you a beginner who is tired of making sloppy stick man and weird houses? Do you think you can never learn to draw in your life? Do you wish you could make something better than a man consisting of one circle and some lines? Go no further my friends. This book is the only book you need to change your destiny. 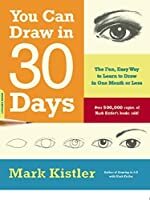 In one sentence, this book is a simple, easy, step-by-step guide that teaches you to draw from simple cube and spheres to a realistic eye and a gorgeous women; in 30 days. I am extremely Are you a beginner who is tired of making sloppy stick man and weird houses? Do you think you can never learn to draw in your life? Do you wish you could make something better than a man consisting of one circle and some lines? I am extremely grateful that I picked this book to begin learning how to draw and understand the fundamentals of graphic design. This book took me from a so-so sketcher to a "Damn! You are good." kinda artist. At first, you may think all the lessons are very basic and would be tempted to skip forward. But don't be taken away by your emotions, my friend. Practice each challenge and super challenge of the chapter, every day. Don't skip any one. In the end, commitment and consistency pays off. أعتقد أنني تجاوزت مرحلة تعلم أساسيات الرسم،لكنني أبحث عن مراجع جيدة لتعليم الرسم لأنني سأمتهن التدريب عما قريب،لي تجربة طويلة وسيئة مع الرسم وخبرة في "تأخير إتقان الرسم وتضييع الوقت"،اطلعت على هذا الكتاب في أقل من نصف ساعة لأن معظم الموجود معروف بالنسبة لي..أرى أنه كتاب رائع لتعلم الرسم ذاتيا مع الاستعانة باليوتيوب لأن الرسم يحتاج لرؤية حركة يد غيرك وهو مناسب لجميع المراحل،حتى لو احترفت الرسم ربما تجد بعض التفاصيل البسيطة التي لم تتعلمها أو لم تكن تهتم بها حين تعلمت الرسم. The book has some fun exercises that show basic tricks for drawing. However, it lacks a depth of explanations of fundamental or foundational drawing skills. It serves a purpose as an entertaining launch pad to improve drawing. One of the basic skill of learning to become a self-taught graphic designer is drawing. This book was mentioned in one of the blogs and I started to learn to draw from this book. I didn't do any drawings or sketches since I left my high school, which is almost 15 years. I always got a barely pass grade for my Arts subject during high school. Besides, my previous jobs never required a drawing skill. I always feel drawing is an innate talent until I started to learn drawing from this book which te One of the basic skill of learning to become a self-taught graphic designer is drawing. This book was mentioned in one of the blogs and I started to learn to draw from this book. I didn't do any drawings or sketches since I left my high school, which is almost 15 years. I always got a barely pass grade for my Arts subject during high school. Besides, my previous jobs never required a drawing skill. I always feel drawing is an innate talent until I started to learn drawing from this book which tells me that my thinking is probably wrong. I liked this book and I think I have improved however I don't think I can use the skills to be able to draw things from life. I can draw the things we learnt well but that's about all. Very encouraging tone to the book. It made me want to learn to draw. The final two lessons (the face and the hand) could have used some of the same detail of the earlier chapters. But I guess eventually, I can't depend on the book to tell me how to draw everything, but I'll have to go out and practice on my own. I felt like I accomplished something by staying with it. I picked up this book because I wanted to learn to draw of course. I have an idea for a webcomic and I don't know any non-flaky artists. I'm digressing. So I wanted to learn how to draw but sadly, I didn't finish the book's lessons even though I was only 10 lessons away. The book did not lie. It made drawing easy and fun and I almost did it in 30 days. I think the biggest thing the book did was trying to change the noob (me!) mindset. Drawing isn't just a gift and you can train your eye correctly I picked up this book because I wanted to learn to draw of course. I have an idea for a webcomic and I don't know any non-flaky artists. I'm digressing. So I wanted to learn how to draw but sadly, I didn't finish the book's lessons even though I was only 10 lessons away. The book did not lie. It made drawing easy and fun and I almost did it in 30 days. I think the biggest thing the book did was trying to change the noob (me!) mindset. Drawing isn't just a gift and you can train your eye correctly. However, as I did the lessons I did get tired of doing the same basic drawings. They just started to lose their appeal to me. While I did try to spice it up, I just wasn't very good at it. I think the biggest downside to the book is that at the end of each lesson, there's a bonus or advance lesson if you will. While I started to do it at first, they became a bit too daunting. Also, when looking at the drawings other students made, I would feel disheartened when I saw my crappy drawings. I really think those shouldn't be in the book or at the end or I should have more confidence in my drawing skills. First some background, I have no experience or training (including any sort of short courses) in drawing; I picked this book for this very reason. I was looking for a book that would teach me the basics and not just give me examples to copy with no explanation or show me artists work that I couldn't possibly reproduce at my current skill level. This book was exactly what I was looking for. Mark Kistler's easy going and confidence inducing style was encouraging throughout the book and he introduce First some background, I have no experience or training (including any sort of short courses) in drawing; I picked this book for this very reason. I was looking for a book that would teach me the basics and not just give me examples to copy with no explanation or show me artists work that I couldn't possibly reproduce at my current skill level. This book was exactly what I was looking for. This is quite nice - it got me using my sketchbook again, which was my goal. It has 30 chapters that build on each other and introduce drawing concepts in an approachable way. Two things I didn't like: The tone is a bit too... American? for me - the author constantly says things like "this is AWESOME and you will LOVE it and will keep drawing circles ALL THE TIME because they are so FUN!! ", and I found myself skipping those lines because they have the opposite effect on me. But if you leave out This is quite nice - it got me using my sketchbook again, which was my goal. Two things I didn't like: The tone is a bit too... American? for me - the author constantly says things like "this is AWESOME and you will LOVE it and will keep drawing circles ALL THE TIME because they are so FUN!! ", and I found myself skipping those lines because they have the opposite effect on me. But if you leave out the "motivational" parts, the exercises are pretty good. And, some chapters make reference to drawing exercises that you were supposed to find on his website - but all I could find was paid content and no mention of this book. I've just started working my way through this book for the second time. The book does a remarkable job of distilling what people have discovered about representing the 3-dimensional world on a 2-dimensional piece of paper into 30 well graded and structured lessons. I really can't find any faults - except that there doesn't appear to be a follow on book to take the budding artist to the next level. If anyone knows of a book of this quality for figure/portrait drawing then please let me know. 30 drawing lessons that build well on the previous. It had been about a decade since I had done much of any sketching so this was a good refresher. The lessons will definitely start to take more than the 20 min advertised by midway through. I did about 23 lessons in 25 days and then let the rest drag out over a number of weeks. Su šita knyga aš išmokau pamilti piešimą. Mokykloje man dailės pamokos būdavo pačios baisiausios, niekas mūsų nemokė nei kaip piešti, nei jokių ten tai fundamentaliųjų piešimo taisyklių. Pasakydavo temą ir liepdavo piešti. Ir viskas. Tai žodžiu, visąlaik maniau, kad piešimas TIK talentingiems, TIK tiems, kuriems visos tos taisyklės kažkaip automatiškai galvoje yra... Taip yra daug žmonių, kurie tiesiog jaučia kaip pieštuku sukurti įspūdingą paveikslą ir jaučia, kur reikiamą brūkšnį paddėti..bet Su šita knyga aš išmokau pamilti piešimą. Mokykloje man dailės pamokos būdavo pačios baisiausios, niekas mūsų nemokė nei kaip piešti, nei jokių ten tai fundamentaliųjų piešimo taisyklių. Pasakydavo temą ir liepdavo piešti. Ir viskas. Tai žodžiu, visąlaik maniau, kad piešimas TIK talentingiems, TIK tiems, kuriems visos tos taisyklės kažkaip automatiškai galvoje yra... Taip yra daug žmonių, kurie tiesiog jaučia kaip pieštuku sukurti įspūdingą paveikslą ir jaučia, kur reikiamą brūkšnį paddėti..bet taip pat piešti galima išmokti... ir tai gana smagu..Aš šią knygą ne tik skaičiau, bet ir piešiau kartu. Kai kurios pamoks pavyko geriau, kitos blogiau, bet tikrai buvo smagu ir supratau, kad tuo geriua pieši, kuo daugiau pieši. Practice makes perfect.Kaip ir visose srityse ar tai būdų kalbų mokymąsis ar piešimas..
Pamokas lengva sekti ir piešti kartu. Gal ko man pritrūko: tai šiek tiek daugiau paaiškinimų kaip tuos šešėlius "matyti" ir piešti, visas pamokas atlikus taip ir nesuprantu, kaip ten juos teisingai padaryt :D. Knygoje daug Mark Kistler mokinių piešinių. Dažnai labai įspūdingi ir wauw.. Ir man mintis buvo, kad šitą knygą dar artimesnę tokiems, kaip man, visiškai žaliems, padarytų iliustracijos, kur ir jo mokiniams ne taip puikiai pavyko nupiešti. Žodžiu, šiek tiek prikepusių blynų, jie tikrai suteiktų daugiau drąsos toliau bandyti..nes bent man asmeniškai, kai kurie piešiniai na jau tokie visiškai nevykę išėjo.. O kai pažiūrėdavau į pavyzdžius kitų, tai ir visai rankos nusvirdavo. Man, kaip visiškai nieko neturėjusiai su piešimu šita knyga buvo tikras atradimas, kuris grąžino tikėjimą savimi ir išgujo mintį, kad piešti gali tik išrinktieji. Man labiausiai patiko ir buvo lengviausia piešti apskritimus ir cilindrus :D. Daugiausiai džiaugsmo - gėlių piešime. Daugiausiai juoko- veido piešime. Ir labiausiai nepavykęs piešinys - veidas. Skaityt ar neskaityt? Štai kur klausimas. Skaityt: -su piešimu nieko bendro neturintiems, bet norintiems pabandyti; -galvojantiems, kad piešimas tik išrinktiesiems (sugriaus šitą mitą, jei tik paimsi pieštuką tarp pirštų); -norintiems išmokti piešti 3-D.
Neskaityti: -jau viską išmanantiems apie piešimą. It is a fun book. It has 30 lessons that teach you how to draw a particular figure. It is not traditional in the sense that you are not taught much about lines, or shading or tones, so if you're looking for that, this book is not for you. I recommend this for those who want to get into drawing but don't want to dedicate too much time to it at first, and want to avoid feeling overwhelmed by it. By the end, I am less self conscious about my (def not brilliant) drawings, and have gotten quite a bit It is a fun book. It has 30 lessons that teach you how to draw a particular figure. It is not traditional in the sense that you are not taught much about lines, or shading or tones, so if you're looking for that, this book is not for you. A very fun and easy to follow drawing book. I used to draw a lot when I was younger. This helped me to find my joy for drawing again. The first half of the book was strong, the lessons were very eye-opening. Towards the end, I didn't enjoy the concept of "tracing". Definitely recommend this for those who want to learn how to draw. If you are a beginning artist, I would highly recommend this book. It's clearly written and shows you how to draw different things using basic fundamentals. I would recommend this if you are starting out. My drawing has definitely improved since beginning reading. Mark Kistler has been able to teach me many things about drawing and from this, I have gone on to draw better than I ever have before. Drawing is simple, and Mark shows you how. ممتاز جداً للمبتدئين اللي لدرجة مايعرف يرسم مكعب أو يظلل أو يرسم شكل اسطواني.. وكذلك مناسب للأطفال..
أو لأشخاص يعملون في مجال تعليم الرسم. الدروس مقسمة بحيث يكون كل يوم درس بهدف الإنتظام بالممارسة لمدة ٣٠ يوم وكل درس ممكن ياخذ ٢٠ دقيقه فقط من يومك. Very proud of what I have achieved through the help of this book. The difference between day 1 age day 30 is amazing. As someone who has been interested in drawing this helped give me certain principles in a way that kept me engaged. Easy clear step by step instructions to learn to draw. I recommend this book. This is the book that started me on my drawing journey. You do actually learn how to draw with the tips/tricks they teach you. Easy to follow. They have great examples and steps to look at and follow. Mark Kistler teaches art. He has run thousands of elementary school workshops, written art books, and starred in the public television series The Secret City, The Draw Squad, The New Secret City Adventures, and the Emmy-Award-winning Imagination Station, all teaching art.